Ann's autobiography is now in the shops and available on Kindle. From her early family life in Singapore and her convent school days to her student ambitions at Birmingham and Oxford, and her long-serving years as an MP, this is the life story of one of our most outspoken and celebrated politicians. Offering unique insight into her time as a Minister in three Departments and the Shadow Cabinet in the 1990s, Ann also explains the roots of her conversion to Catholicism in 1993 and her deeply held views on abortion and gay marriage. 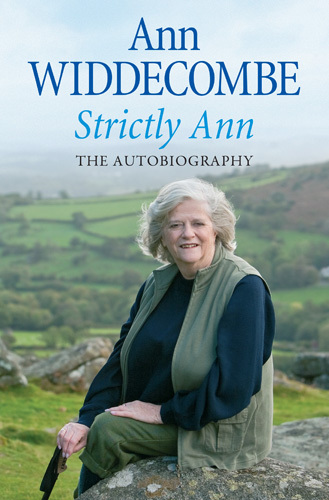 A rare anti-hunting Tory, who campaigned for prison education and once put on a miner's overalls to go down a coal mine, Ann Widdecombe has never been afraid of controversy. Her memoirs reveal a singular personality who lives life to the full. From feisty and witty appearances on Have I Got News For You to her unforgettable and star-turning performances on Strictly Come Dancing, Ann has earned her place in the public's affections and has been heralded as a 'national living treasure' by the Guardian. Also containing Ann's trenchant views on the Coalition, MPs' expenses and the state of the nation, this is a provocative and entertaining read. Frank, fearless and engaging, Ann's autobiography will delight her admirers and win her yet more fans. Buy the Book or buy the Kindle Edition. but there's NEVER been a political autobiography quite like this"